We're typically not big fans of gore and horror. But how can you not like The Walking Dead? Sure we watch a lot of it between the fingers strategically covering our eyes, but in between the zombie kills is real emotion and human connection not seen on most TV shows. And as big fans, we were thrilled to be asked by the Archive of American Television to cover the red carpet at their recent Evening with The Walking Dead event. We met the creator, executive producer, the all important make-up designer and, of course, the cast. These are our top three moments from the night. 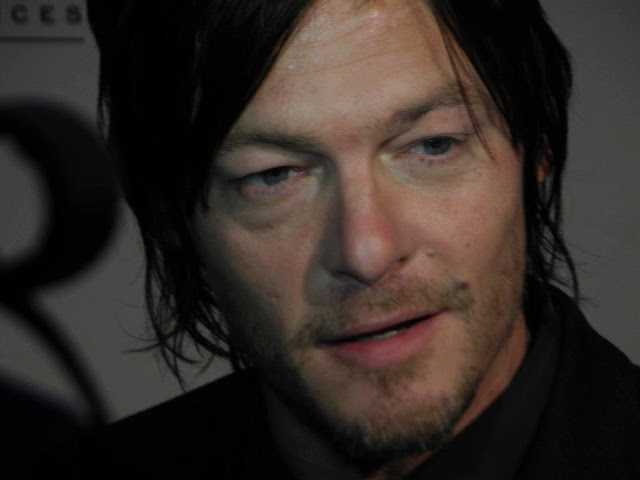 Norman Reedus revealed he's similar to Daryl Dixon in that he's socially awkward and insecure. "The heart on the sleeve thing, I guess that's me." But he also admits he would "never survive in the wilderness with or without a zombie apocalypse." After describing how he's similar and different from his character, Rick Grimes, we asked Andrew who his favorite TV dad was. He, somewhat reluctantly, picked the dad on The Waltons. Danai Gurira, who plays Michonne, said she thinks people like The Walking Dead because it poses the question, "Who would you become in that kind of situation?" She had researched women in war for a play and learned about young girls who became rebel fighters in Liberia. She stated, "I'd probably become one of those chicks, because it's really about power." Watch all of our red carpet interviews at the Archive's YouTube page. And tune in to The Walking Dead on Sunday nights at 9 p.m. EST/8 p.m. Central on AMC.